The PSG-Programming System Generator developed at Darmstadt produces interactive language-specific programming environments from formal language definitions. From an entirely nonprocedural specification of the language's syntax, context conditions and denotational semantics, it produces a hybrid editor, an interpreter and a library system. 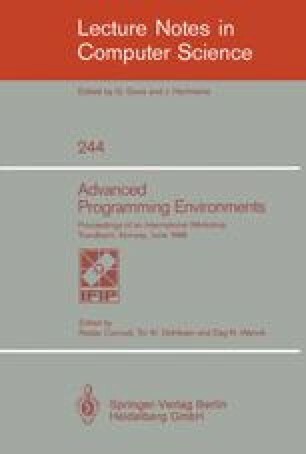 In this paper, we give a detailed description of PSG-generated environments. The main features of PSG editors are discussed. In particular, we describe the interplay between text editing and structure editing, the PSG fragment concept, the interactive handling of syntax and context errors and the context-sensitive error prevention mechanisms. We include an example editing session demonstrating the user interface of the PSG implementation on PERQ workstations, utilizing graphical devices.